In terms of physical activity, what do you think the average human is capable of at 43? A beer league softball game on the weekend? Tossing the pigskin around with Junior (until the hernia starts to act up) on Sunday? Maybe a mile on the treadmill on a truly ambitious day? 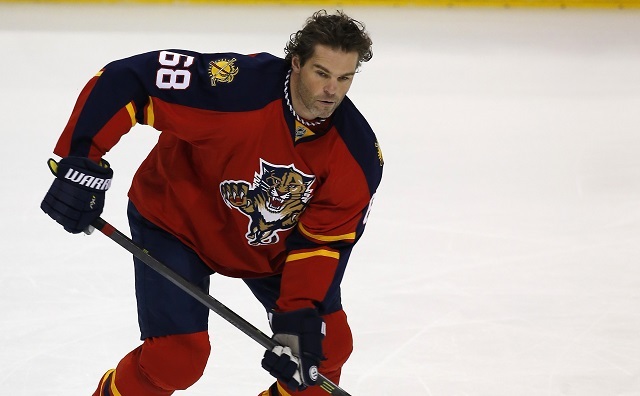 What’s Jaromir Jagr doing, just three months shy of his 44th(!!) birthday? Only playing in the fastest professional sports league in the world—and excelling, at that. Thursday night the ageless one notched his 9th goal of the season—the most on his middling Panthers squad, and the 731st of his storied career, tying him for fourth all-time with Marcel Dionne. At just past the quarter pole of the season, Jagr is on pace for 27 goals and 62 points, numbers which, if reached (and even for the amazing Jagr, it is an if) would give him arguably the greatest season a 40+ year old man has ever had, eclipsed perhaps only by Gordie Howe’s age 51 season in 1979-80. What Jaromir Jagr is doing is not normal. Heck, it goes beyond merely not normal. It’s freakish. With all due respect to Howe and his iron man accomplishments, the brand of hockey played in Howe’s day is only comparable to todays game if you pop an old tape in the VCR and hit fast forward—even then, it still might be slower. Hockey is a young mans game, more so now than ever. With the removal of (most) obstruction plays and hooking, it’s never been faster. Those long in the tooth or bereft of footspeed can’t simply just hook on and catch a ride anymore. Play till 40? Bah, most players these days are hanging by a thread once they hit 35. Apparently no one told Jagr. Sure, he’ll joke about how he’s old and slow. He’ll (in jest) ask fans not to vote him into the all-star game, tweeting “3 on 3 would kill me, and I don’t want to die yet:)Thank you for understanding. Too old:)” (smiley faces his, not mine). But, at the end of the day, this is the same Jagr that leads his team in points. The same Jagr who, despite being more than 20 years older than both his linemates, still manages to be the most productive man on the ice. He’s stated he wants to play until he’s 50, and at this point, who can tell him no? « Previous Article The Baddest Kid on the Block: Is Chris Weidman vs. Luke Rockhold the Sleeper Fight of the Night?